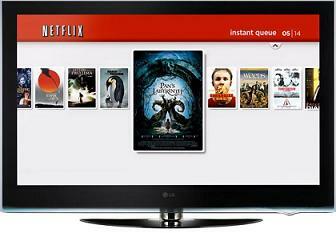 Netflix, the subscribe-by-mail, internet streaming service and LG have partnered up to bring you, the viewer, Netflix-enabled broadband HDTVs in plasma and LCD offerings. So, with this new breed of TV, forget additional cabling and set top boxes, with Netflix software integrated into the TVs you won’t be able to get enough of instantly streaming Netflix and Netflix HD content. The accompanying remote also allows you to get the low-down on film synopses, rate movies and fast forward/rewind the video stream. Exact screen sizes, model names and price tags are yet to be confirmed, but it’s tipped for a spring release and should be making an official appearance at CES this week, so with Susi, Zara and Dan on the case, expect to hear more very soon.